Are you are hired by companies outside your employer for on a self-employed basis? I was meeting with a physician recently that is hired from time to time to speak at various events by outside companies. During the discussion, I discovered that his only tax-deferred savings were by making maximum employee contributions to his full-time employer’s 401(k) retirement plan, $18,500 for 2018 and $19,000 for 2019. Between him and his wife, this couple’s adjusted gross income is approximately 450K, putting them squarely in the 35% Federal marginal tax bracket and 10% marginal tax bracket for the State. The client did not need the additional income for current use, so I suggested they use a SEP IRA to help save some of their professional speaking income in a tax-advantaged way. It is possible to contribute to BOTH a SEP and a 401K in the same calendar year. Here a few items that we want to pay attention too. The maximum deferral an ‘employee’ can make in 2018 is $18,500 combined across all defined contribution plans. In this case, the client made the maximum employee contribution for 2018 to his 401K. The maximum contribution for a defined contribution qualified plan is $55,000 for 2018 and $56,000 for 2019; this limit is for the combined employee and employer contribution amounts. The defined contribution qualified plans limit is on a per plan basis, not combined meaning that the limit for the client is $55,000 per plan in 2018 in this case. All contributions into a SEP are made as ‘employer contributions’ and are limited up to 25% of income. In this example, we are limited to 25% of the self-employed ‘speaking income.’ To max out the SEP contributions for 2018 this client would need to have total compensation from self-employment of $220,000. There are a few other tax rules/considerations to discuss, so we suggest you speak with your CPA before doing anything. Below is a case study of the deferred taxes this client could save in 2018 taxes. When we ran the client's retirement plan, we anticipate this client to pull these dollars out in the 24% Federal marginal tax bracket and because the client plans to move to either Texas or Florida in retirement, under current tax laws will not be subject to State income taxes. The tax savings for this client is about 21% plus any deferred growth. Even if tax brackets shift upwards when the client is retired, the likelihood of meaningful tax savings is very high. While the $4,050 tax deferral by saving $9,000 in a SEP in a single year is not a large number, it will add up over the years. Over the next fifteen years, I anticipate this doctor to have a $180k account balance in this SEP. Consequently, we anticipate that we will have successfully deferred the timing of the tax liability from peak income years to a lower future rate in retirement resulting in an estimated $60k in income tax savings. This idea is not a singular ‘homerun’ tax savings strategy when it comes to retirement planning. 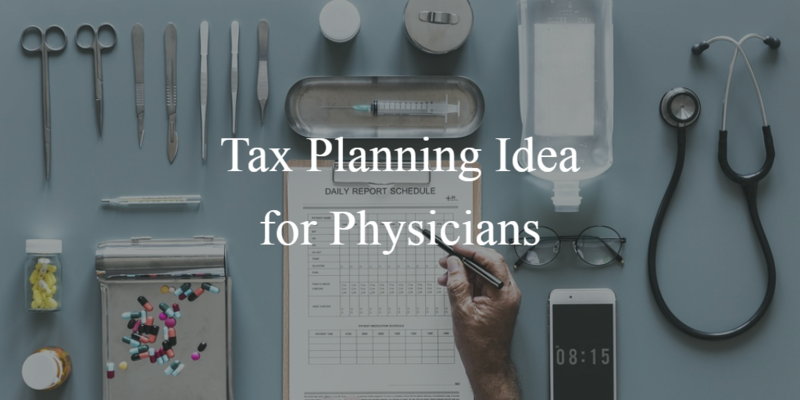 However, if we pay attention to items like this one, investing tax efficiently in brokerage accounts, using backdoor ROTH’s, leveraging the HSA correctly, structuring income in retirement to come out of the correct tax buckets, and utilizing a variety of other planning tools we can improve the tax efficiency of the plan.